A while back I stumbled upon this link, which details ten unusual eBay purchases. One of the items was what purported to be an 18th-century Vampire Killing Kit. It was more likely a Blomberg Kit (which have a murky and tangled past of their own), but I quite liked the idea of such a project so I decided to take a crack at making one myself. I gave this one to my Secret Pumpkin this year, but my notes are below if you’d like to make one of your own. Although this project is somewhat on the involved side, no single piece is particularly difficult; there are just a lot of pieces and it takes a while to put everything together. However, I think the results are worth the effort. You can create a stripped-down version to carry around as a prop when you go clubbing, or display a full kit on a bookcase as an decorative object. Plus you can also use it to kill vampires, should you encounter any. The mallet was an inexpensive woodworking mallet, which was artificially aged: It was whacked with a hammer, gouged with a screwdriver, abraded with steel wool, then stained with a dark wood stain. The stake started life as a piece of 2×2 lumber. It was cut down to reasonable stake size (you can ask the hardware store to do this for you; one piece of 2×2 should yield several stakes) and then one end was whittled to a point. A dremel tool was used to cut a shallow channel about 2″ wide around the other end and to carve a little cross shape on two opposite the sides below the channel. The stake was then aged the same way as the mallet. The little crosses (unfortunately not visible in the photo above) were filled in with a darker stain. Finally, rough twine was wrapped around the stake in the carved channel and hot-glued in place. The cross was found at a craft store in the decorate-it-yourself wood section. It had a hole in the back for hanging on a wall; that was filled in with wood putty and then the wood was aged as for the mallet and stake. A small saint’s medal (which was bought on eBay but can also be found at many places online) was bound to the front with sinew thread. 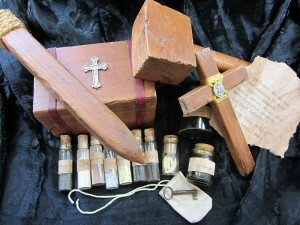 The box for the vials was a wooden recipe box found in the same section of the craft store as the cross. It was similarly aged, then some little strips of leather (which originally came from an upholstery sample swatch) were hot-glued over the little channels that recipe boxes have for no reason I can fathom. The leather was made to look worn by going over it with sandpaper. A metal cross (which I think originally came from Oriental Trading, although they don’t seem to have the same style now) was hot-glued on top. The glass vials came from a variety of sources; the matching ones for the garlic and similar substances were from Specialty Bottle; the mismatched ones were left over from some past project. The glass and corks were aged with a bit of stain. The labels were scans of handwriting (my sister does calligraphy as a hobby and was kind enough to write out the list of words I gave her; any “handwriting” font would work too) which were printed out and then aged. I initially tried dipping the paper in tea but the result wasn’t dark enough to suit me, so I wound up diluting brown acrylic paint with water and brushing that over the paper. A few of the items were more authentic: Brimstone is just another name for sulphur, which is extremely cheap; I got the holy incense from the same vendor. The coffin nails were likewise authentic; you could use any small nail but I liked the antique look of the heads on these. The “coffin key” was a real antique skeleton key; it was found on eBay (it was actually part of a set of six different ones that was sold as one lot, so there were leftovers for other projects). It was too big to fit in a vial so I sewed a simple little bag out of scrap muslin dyed with strong coffee. The “trophy fangs” were fox teeth. The Latin note, also penned and scanned by my wonderful sister, had text as follows: “Is est Sanctus Res ego sum decessio secundum ut meus pius futurus adsuesco assuesco obviam Malum, Nox noctis Ingredior Nosferatu, Lamia quod Intentus. In nomine Patris, et Filii, et Spiritus Sancti. Amen.” Which translates roughly to, “This is the Holy Thing I am leaving behind to my own kind to be used against the Evil, the Night Walker, Nosferatu and vampire. In the name of the Father, the Son and the Holy Spirit. Amen.” That note was aged with dilute paint as for the labels, then the edges were carefully burned to make them ragged. Shadow Manor acquired this assemblage in 2013 from a combined estate auction in Philadelphia PA. It was one of several offerings in a small series amongst what was otherwise a rather commonplace collection from the estate of Charles Gibson Jr. of Clover St., Philadelphia PA.
One wooden cross with a saint’s medal bound thereto with sinew. A “thunderstone,” or fragment of iron meteorite, widely claimed to have power against dark forces. One cotton bag containing a coffin key. One glass vial, intended for holy water. One small corked bottle containing a number of sharp fangs of some animal of unidentified species. One large wooden mallet, well worn. One wooden stake, carved with a crucifix. One handwritten note, in Latin. One folding metal spade of U.S. military issue. One pair of men’s black workboots, well worn. She seemed pleased with the effort (there are more photos of the kit at her post, and I yoinked the one above from there as well because hers turned out better than my reference shots. Photography is not my long suit). Anointing oil could simply be olive oil or other oil of your choice (I didn’t include it in the kit I mailed for fear it might leak). Faery Stone is another name for Staurolite, which frequently grows into a natural cross shape. You can buy the formations online at both gem-and-mineral shops and metaphysical/witchcraft suppliers. They often come polished as jewelry, but the rough uncut type might look nicer for the kit. Something called “Bat’s Head Root” is often sold as a protective magical charm, purporting to be a rare root from Mexico. They’re actually either the seed pods of Martynia annua (which you can see here, halfway down the page) or the fruit of Trapa bicornis (seen here). Either will work, since you’re interested in the shape more than the provenance. The ritual dagger could be any knife you want; wooden-handled athames are inexpensive and could be aged as for the other wooden items in the kit. A Phurpa is a Tibetan “magical dart” that’s used to ward off evil. They’re widely available at both metaphysical/witchcraft sites and at import stores. The surgical scissors, tooth pliers, metal syringe, Latin prayer book, and rosary are all available on eBay in various sizes and price ranges. Shop around until you find the perfect piece for your kit. The leather valise can be purchased on eBay as well, or you could make a carpet bag, velvet-lined box, or some other container. What you’re mainly looking for is something fairly old and beat-up, which is large enough to hold your gear but small enough to carry easily. So that’s the kit. It was a lot of fun to build, and the result was very satisfying. Wow, that turned out fantastically! I am impressed. A friend of mine did something similar for her boyfriend with a zombie survival kit, but it wasn’t nearly this nice. I totally should have photographed the stake with the cross facing up. I was a little excited and addle-brained. Thanks for this post–I was hoping you’d tell all about how you put this together! I’m going to need two houses. One for “normal” crap and one for all of the awesomeness. I did one of these for my Secret Ghost last Halloween! I used a wooden cigar box and made pseudo-Victorian labels to cover the cigar adverts. I called it “Dr VanHelsing’s Vampyre Eradication Kit and Gentleman’s Companion” and put a list of the preternaturals it was effective against on the bottom with disclaimers! It was so much fun to put together. So much awesome. I want a glass display case so that I can make something like this and then put it on display. If you scaned the note and lables your sister wrote, can you attach a copy here so we can print one out?